When Apple opened the doors to developers to write and sell products for the iPhone and iPod touch, it began a veritable gold rush for unknown companies. Here, developers could write programs quickly, distribute them to the market via the iTunes Store and find eager customers waiting to snap up their offerings. Even so, some programs still have to prove themselves. Vegas Pool Sharks functions as the casual pool simulation one might expect to find at the App Store. Once installed, players are offered the chance to take on computer-controlled opponents in Straight Pool, Eight Ball, Nine Balls, Practice and Opponent modes. Two Ball, Side Pocket: Vegas Pool Sharks takes advantage of the touch screen, tilting, and gesture features of the iPod touch and iPhone. But flaws in the game’s artificial intelligence and gameplay detract from the experience. The game makes full use of iPhone and iPod touch features such as the device’s touch screen, vertical to horizontal tilting to change screen perspective and gestures. Have a tough shot ahead of you? Simply use the right finger gesture to activate trick shots such as top spin, back spin and left and right directional spins. These controls, combined with good graphics and sound, make for a more immersive pool experience than you might expect. You’re able to to zoom in, rotate the camera angle and either take a shot that the computer has set up or set your own shot, if necessary. Unfortunately, this is where things become muddled. In the midst of a good, quick game are flaws that inherently trip things up. 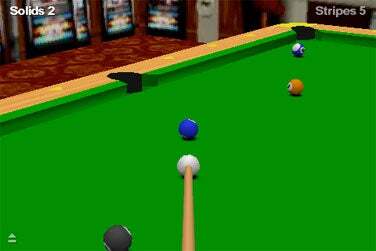 While the controls are for the most part good, Vegas Pool Sharks tends to offer you its idea of the perfect shot to take after each turn. From there, you end up struggling to control the power of your shot, which all too often winds up being either too much or too little. Setting up custom shots feels harder than it should, given the game camera’s jerky rotation. The end result: there’s a little too much guesswork required of players. Additional shortcomings emerge in the lack of balance within the game’s artificial intelligence. Even on the easiest opponents, the computer will clear three or four successful shots in a row before stopping itself to let you try to catch up. Attempt to play an advanced opponent and the only shot you may find yourself making is the break shot, as the computer will clean up for the entire game, never allowing you a second shot. Finally, there’s no multiplayer mode, which seems like an absolute must-have for this kind of game. It would certainly be nice to pass the game back-and-forth with a friend so that you can establish billiards supremacy. Though Vegas Pool Sharks is as a fun game to while away 10 minutes on, there’s nothing about it that makes it feel like a “must have” title, a factor which the price I paid to download it questionable. (Note that the App Store lists the $2 price I paid as “for a limited time only.”) You can try out the lite version of Vegas Pool Sharks for free to judge for yourself, but I found this app to be the sort of game I can take or leave—hardly a ringing endorsement when there are so many other options at the App Store where I can spend my gaming dollars.